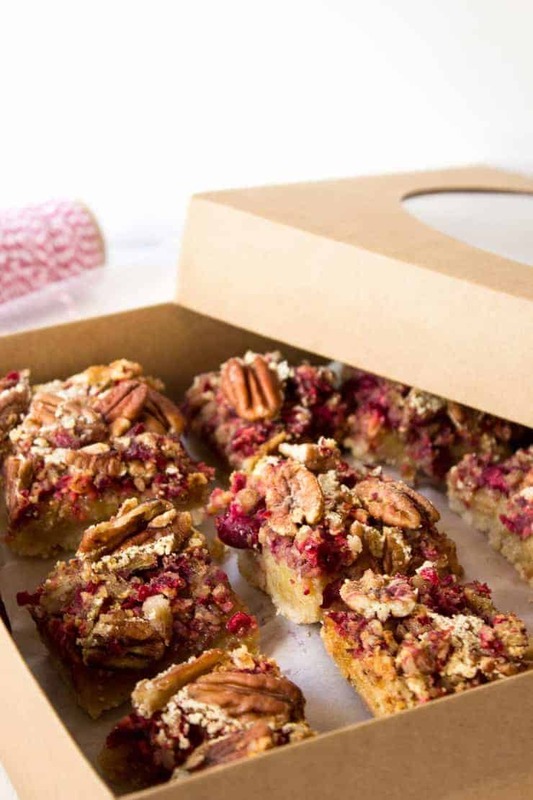 Cranberry Pecan Bars are perfect for gift giving or dessert trays for the holidays. The holidays are coming and for me that means it’s time for baking up some love! 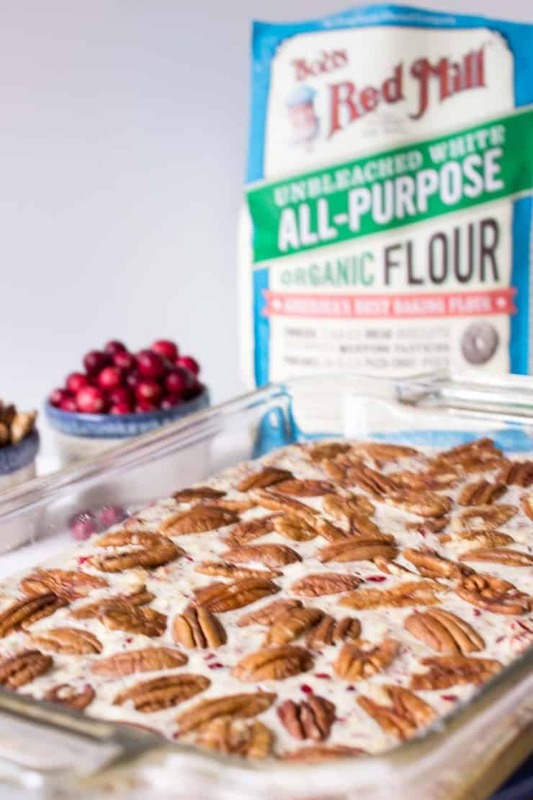 This year I am baking Cranberry Pecan Bars and sharing with friends, family and neighbors. I like to give gifts to all our neighbors and friends, but I don’t purchase store bought gifts for them. Instead, I spend a couple of days in the kitchen baking up a storm. My kids love to help with the baking and the delivering! This year I will be baking Cranberry Pecan Bars. They are a cross between a pecan pie and a cookie. When baking I love to use the highest quality ingredients to make my creations truly amazing. Bob’s Red Mill products are of the highest quality! Here’s a coupon you can use when buying Bob’s Red Mill products. In addition to baking for gifts, I also love to bake an assortment of cookies and bars to fill a cookie tray. I will often take a tray full of home baked goodies to a party or keep it available for guests who stop by. Some of my favorites are Raspberry Bow Tie Cookies, Cranberry Orange Swirl Cookies, and Sugar Cookies. 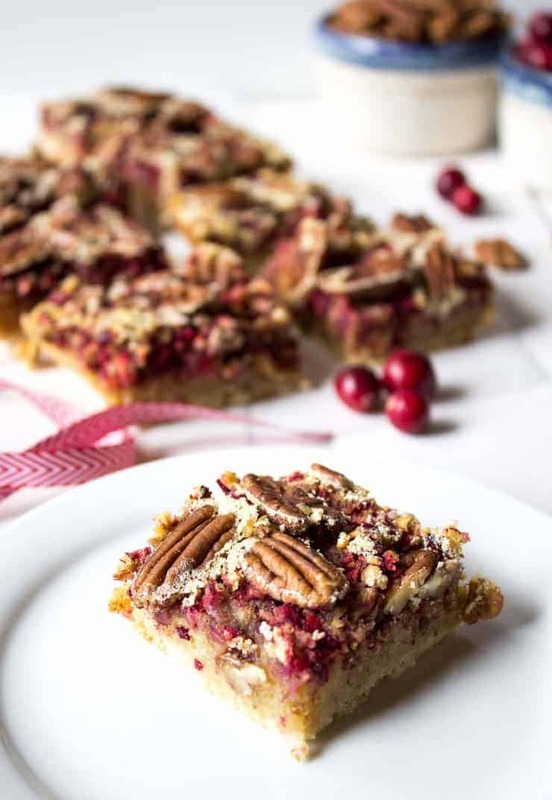 This year I will also have these Cranberry Pecan Bars on the tray. When baking for the holidays, you want to plan ahead for your baking day. Make a list of everything you want to make. Create a list of ingredients. Make certain you have all ingredients on hand. If making several different recipes, plan the order of your baking. Start with cookie dough that has to be chilled before rolling or baking. Plan space for cookies and bars to cool. Have gift giving containers ready . Think about bows, tags, or other finishing items. 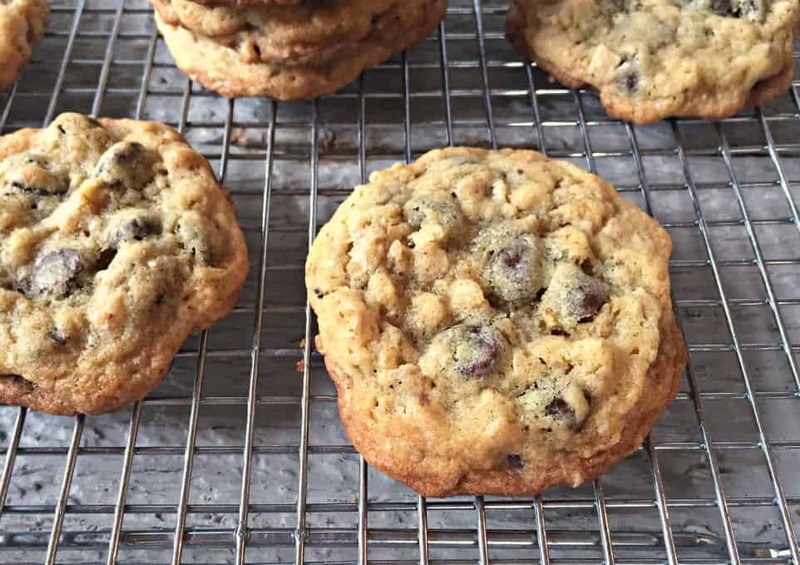 Allow cookies and bars to cool completely before packaging. 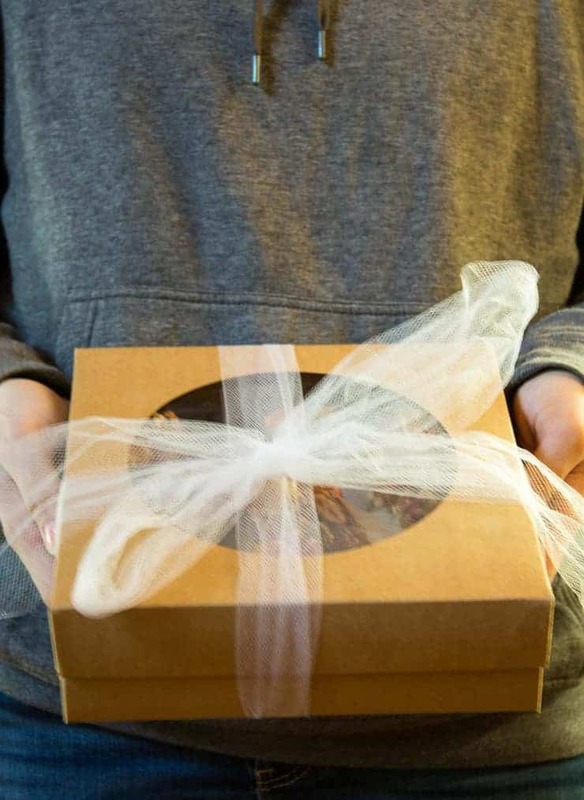 Deliver with a smile and spread the love and cheer! 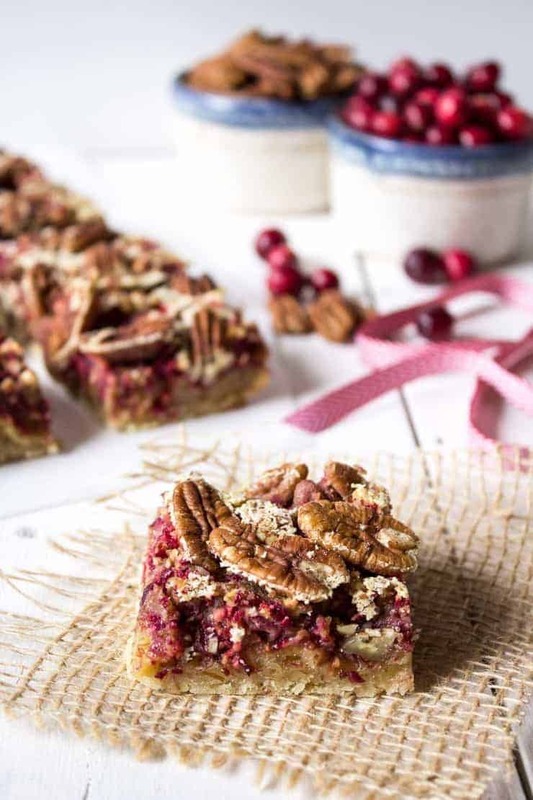 When baking these cranberry pecan pie bars, think about making a couple of batches. They tend to disappear quickly! 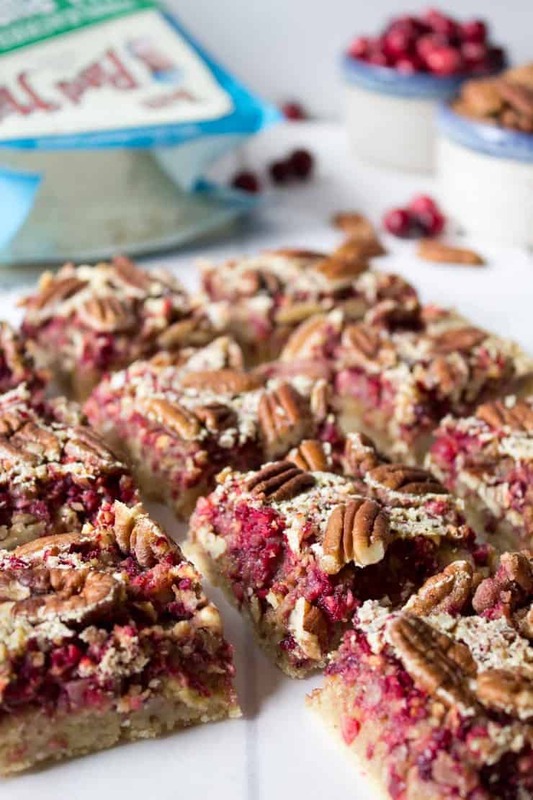 A perfect holiday dessert with cranberries and pecans on a shortbread crust. Place flour, pecans, butter, salt and sugar in a food processor. Process until all ingredients are combined. Mixture will appear dry and lumpy. Pour into a 9"x13" baking dish. Press dough down with your hands. Press edges down so all surface area is even. Bake in a preheated 350 oven for 10 minutes. Add cranberries. Pulse until cranberries are chopped, but still have some large pieces. When crust comes out of oven, pour filling mixture over hot crust. Continue baking for an additional 30 minutes. 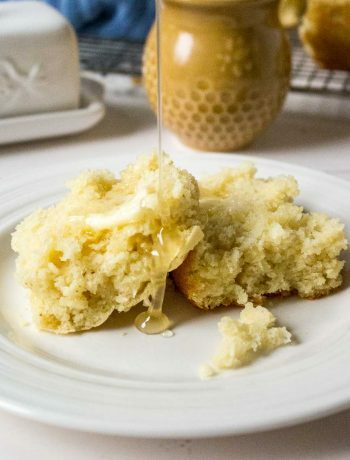 Allow bars to completely cool before slicing. They do make great gifts! They are also delicious…but don’t give them all away! You’ll want some for yourself, too! Yum. Looks good. I almost always have cranberries on hand. Pecans not so much. I’m more of a walnut and cashew person. Walnuts would be great instead of the pecans! Homemade gifts for the win!! Can’t beat it! Every year I give family a basket filled with homemade goodies and some other small things, maybe a candle or nice hand soap. It always goes over so well. These delicious bars would be a lovey addition! That combo just screams Christmas to me 🙂 Pinned! I think they will make wonderful Christmas gifts. Homemade treats are the best! 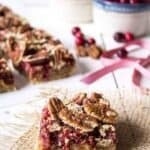 And I would LOVE to get some of these cranberry pecan bars! They sound delicious!! There is nothing I love more than to receive homemade gifts from my friends and neighbors! These bars are holiday perfection! These bars sound amazing, Kathy! Seriously! 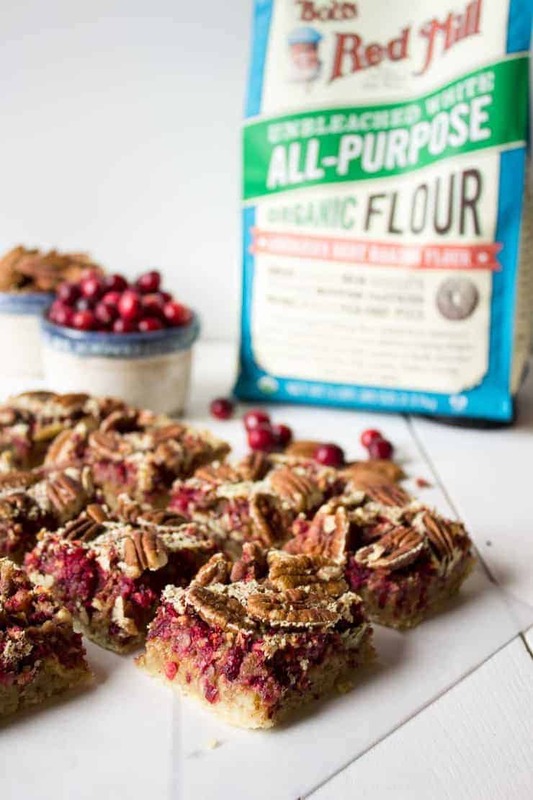 I love pecans, and I love baking with cranberries this time of the year. I bet these disappeared quickly in your house. 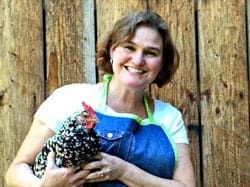 🙂 Also, I 100% agree with you about Bob’s Red Mill…I love their products, and my pantry is always stocked with Bob’s! Thanks for the tasty recipe, my friend! Pecans are my favorite nut Kathy! And I love the addition of the cranberries ! 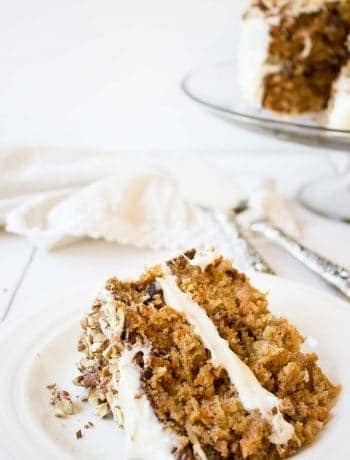 These would be perfect with some added orange zest too! Can’t wait to try them! What beautiful and delectable bars! Wish we were your neighbours to receive them! I would love to share these with you! Too bad we aren’t neighbors!